Ashwagandha is one of the most powerful Ayurvedic herbs. It is soothing, contributes to relaxation and may help in cases of temporary stress. Ashwagandha may also improve energy levels, quality of sleep and wellbeing as well as reduce fatigue. 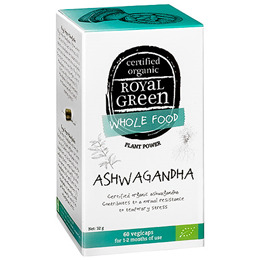 Royal Green Ashwagandha is grown without the use of pesticides. Certified organic, free of fillers and highly concentrated. Ashwagandha (Withania somnifera), capsule: HPMC, anti-caking agents: magnesium carbonate and silicon dioxide. 1-2 vegicaps per day, preferably with a meal. Below are reviews of Royal Green Ashwagandha - 60 Vegicaps by bodykind customers. If you have tried this product we'd love to hear what you think so please leave a review.